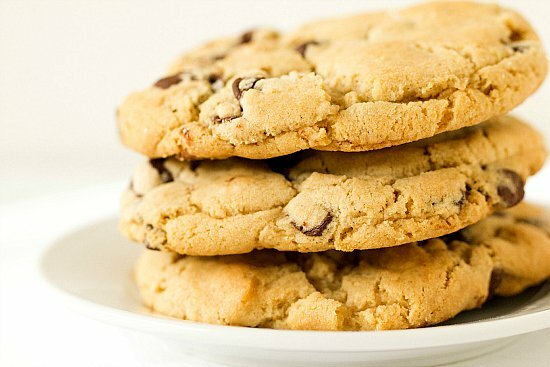 This recipe for chocolate chip cookies, posted by The New York Times in 2009, has taken many food blogs by storm. Not a traditional chocolate chip cookie at all, the recipe uses a combination of bread and cake flours to achieve a chewy, yet delicate texture. The dough is packed full of dark chocolate (no semisweet chips here!) and then is left to chill in the refrigerator for at least 24 hours (talk about a practice in patience!). 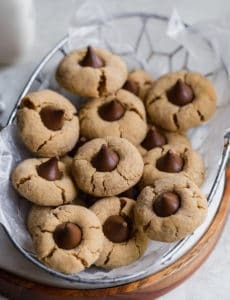 Once you’re ready to bake these babies, a whopping 3½ ounces of dough is rolled into a ball for each cookie, and then sprinkled with sea salt. These huge, gorgeous cookies look like they walked straight out of a high-end bakery, and taste even better! Sift together the cake flour, bread flour, baking soda, baking powder and salt into a large bowl and set aside. Cream together the butter and sugars on medium speed until very light, about 5 minutes. Add the eggs one at a time, mixing well after each addition, then add the vanilla. Reduce the mixer speed to low, gradually add the dry ingredients and mix until just combined, 5 to 10 seconds. Using a rubber spatula, fold in the chocolate chips. Press plastic wrap against the dough and refrigerate for at least 24 hours, up to 72 hours. When ready to bake, preheat oven to 350 degrees F. Line a baking sheet with parchment paper or a nonstick baking mat. Scoop 3 1/2-ounces of dough, roll into a rough ball (it should be the size of a large golf ball) and place on the baking sheet. Repeat until you have six mounds of dough on the cookie sheet. Sprinkle lightly with sea salt and bake until golden brown but still soft, 18 to 20 minutes. 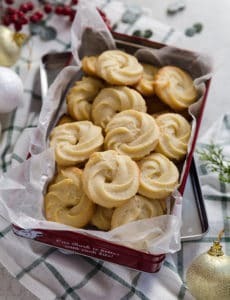 Transfer the parchment or silicone sheet to a wire rack for 10 minutes, then transfer the cookies onto another cooling rack to cool a bit more, until just warm or at room temperature. Repeat with remaining dough (or keep some of the dough refrigerated for up to 3 days, and bake cookies at a later time). Store leftover cookies in an airtight container at room temperature for up to 3 days. Next Post » A Chocolate Chip Cookie Throwdown! I swear I’ve tried every chocolate chip cookie recipe out there and these are the best. I baked at 325 on the middle rack until the tops started to crack and the edges became golden, about 20-22 minutes (my oven gets hot and bottoms tend to burn at 350. I chopped up big chunky dark chocolate bars that left oodles of tiny shaved bits throughout the cookies, like little yummy dalmatian spotted beauties. my go too chocolate chip cookie recipe! These are excellent. I measure the dough to 1 3/4 ounces and bake for 14 minutes. This makes 36 good sized cookies. I have made these quite a few times for friends and family. The perfect giant bakery-style cookie! I just baked the first batch of these cookies and without a doubt they are PERFECT. I left them in the fridge for 48 hours and the taste and texture is exactly what you want in a cookie. I did everything to the letter except the additional sea salt on top as I’m making these with a slightly fussy child in mind. Thank you very much. What a recipe!! These cookies are AMAZING. I thought I had a tried-and-true recipe for chocolate chip cookies from allrecipes.com but these are just kind of next-level cookies. My husband made them and didn’t bother with the 2 different flours. He just used AP flour. I made them and used the 2 different flours. I honestly could not tell a difference. Maybe someone can if you had both cookies and tasted them in a taste test within a few minutes. Who knows. I also sifted the flours and i know my husband didn’t bother. I don’t think it matters. I also used 60% ghiradelli large chocolate chips because I couldn’t find the chocolate discs. (and they conveniently came in a 20 oz bag-so perfect!) Yes, they take a little patience and planning because you refrigerate the dough. It’s worth it. Be warned: you will not go back to other chocolate chip cookies after this!!! I just baked 6 cookies as I wait for my dough to chill for next 24 hours and it cant come soon enough-lol and oh my goodness. Even unchilled, they are the bomb, meaning delish and unique. Thank you for posting this recipe on your blog. The salt is such a great finishing touch too. these cookies are soft and crispy. I made my own cake flour too, so so good. HI HI how do i make double chocolate chip cookies using this recipe? Hi Erya, Do you mean you want a chocolate cookie with chocolate chips? If so, I’ve never attempted to alter this into a chocolate cookie, but I’ll add it to my bucket list! 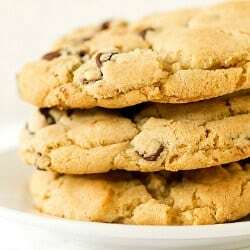 I found this recipe probably 3-4 years ago and it’s The only chocolate chip recipe I use. Hands down the best. These cookies are awesome. Follow the instructions exactly (except I did use slightly less salt on top) and super yum. Like a professional. Easy and yum. These are, without a doubt, the absolute best chocolate chip cookies ever! I didn’t have dark chocolate chips, so used semisweet with no problem. I severely under-baked these cookies, and they are crisp on the outside and chewy-tender on the inside. Just perfection! 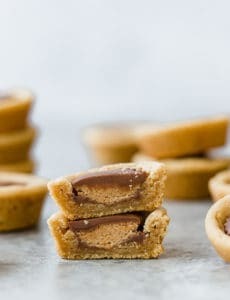 can these cookies be made in a brownie bite pan? If so, how long should they be baked? Hi Laurie, I’m not sure what a brownie bites pan is? Like a mini muffin tin? I’ve never baked a cookie in a pan like that, so I’m not sure how they would turn out or exactly how long they would need to be baked. Hi Mel, I would try knocking back the baking time even more, if they’re turning out hard after cooling. If that doesn’t work, then yes you could reduce the temperature a tad. As far as adjusting the recipe, you could swap more brown sugar for the granulated sugar. I accidentally used salted butter and salt. What can I do to mend the dough? Hi Renee, It will be fine. These are meant to be a little sweet/salty anyway. I have made these a few times and have found the perfect chocolate for them. I use 1 1/2 cups of Jacues Torres dark chocolate disks. I give them a rough chop as they will melt completely into the cookie. I then add 1 cup of semisweet chocolate chips. I like to use Scharffen Berger baking chunks. These will hold their shape when baked. Lots if yummyness in one bite!!! Would these do okay making ahead and freezing until ready to bake? If so, would you freeze after refridgerating 24hrs? Yes, you could do that. You don’t need to refrigerate if you’re going to freeze them. Would there do okay making ahead and freezing until ready to bake? I just took out the second batch from the oven. These are sinfully rich and very very good. My partner does not like dark chocolate so substitution semi and milk and they are great. I could not find cake flour in the grocery store so I went online and make pseudo cake flour. I guess it worked. :) They are crunchy on the outside and chewy on the inside. So very very good! Hi Jose, I use fleur de sel. Just made these while tornado sirens were going off and the risk was totally worth it! Great recipe with the perfect texture, chewiness, and softness. everyone in my family loved them and it was a plus that the recipe was easy! After my entire kitchen was coated in flour (1st time sifter combined with a doubled recipe and some mixer mishaps), I was seriously skeptical that these would be worth the effort (and mess). But they were amazing and worth it, and everyone raved and raved about them! Thank you so much for taking the original recipe, rewording it, and explaining some things for the more novice bakers out there! Also, I think it’s worth noting that the 3.5 ounce dough balls just seemed way too big to me, so I made 2.5 ounce dough balls (still huge! ), and kept an eye on them in the oven. The 2.5 ounce dough balls also took 18-20 minutes in older oven, and I was really happy that I chose to make them smaller. Thanks again! We love all of your stuff (especially the corn dip, chocolate butter cream, and magic cookie bars)! 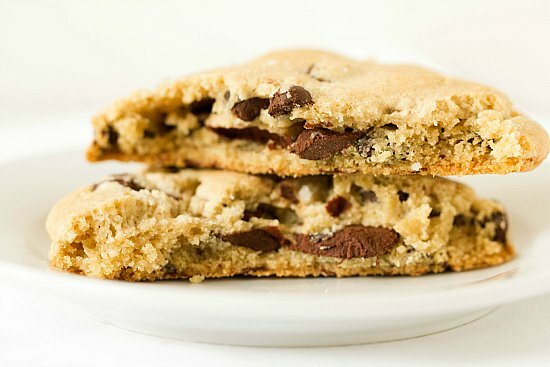 Hands down my favorite Chocolate Chip cookie recipe and everyone loves them! I was having problems for a while with the cookies just not turning out right and then I switched to weighing my ingredients and it has made all the difference. Also, try using half chocolate chips and half white chocolate chips, we love it! can i possibly adjust the size of cookies to about 2oz? Yes, definitely, I have done that. Just be sure to reduce the baking time. If I make these closer to “normal” size cookies, will they bake up differently or less evenly? I haven’t changed anything about the dough (it’s currently resting in the fridge). Hi Kelsey, They will be just fine, I do this all the time! You’ll just need to reduce the baking time a bit, but otherwise they will be perfect.